You’ve decided to teach preschool at home. 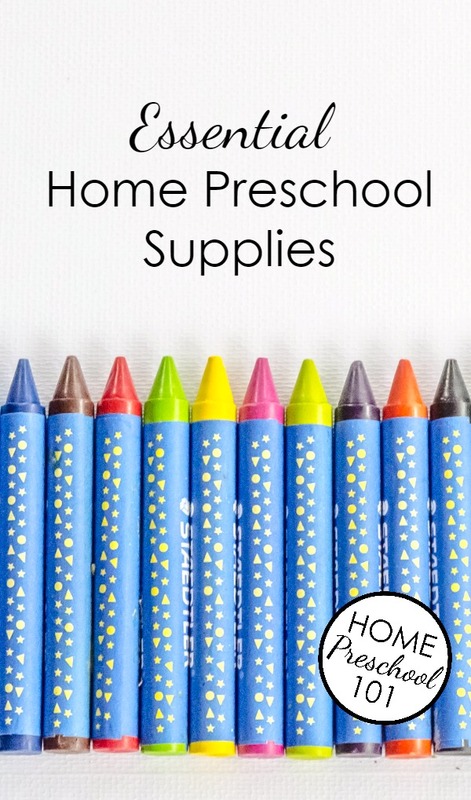 And it’s likely you’re probably filled with a mix of excitement and overwhelm as you start to think about what home preschool supplies you’ll need. In short, the answer is no. You really don’t need a lot to teach preschool at home. Now we realize it’s fun to buy new things, and if you want to buy some extras we totally get it! We’re both guilty of accumulating more than our share of teaching materials over the years. In our experience, though, we know that just a few home preschool supplies are needed to provide an enriching early childhood experience. This list includes our suggestions for things we feel are essentials, things we think are helpful to have, and a few extra bonuses if you still have a little room in your planning budget. You’ll notice that many of these supplies are household items that you might already have at home. Many of them can be found at Dollar Tree, too, saving you extra money! 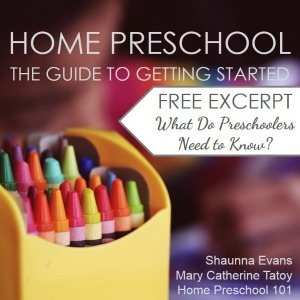 Read on to see what we recommend having on hand for home preschool, and don’t worry about jotting down notes. We’ve put everything into a time-saving printable you can use to map out what you do and don’t need to get. You can download yours for free at the end of this article. Affiliate links included. Each item below is linked to an Amazon product so you can compare prices with what you can find locally or easily order online. We did our best to feature high quality items for the best price we could find. Books-Whether you have a home library or you regularly visit the local public library, books are an absolute must-have for home preschool…but we’re guessing you already knew that! Paper-You can get started with basic white copy paper, but as you move forward with home preschool it is helpful to have different kinds of paper in a variety of sizes and colors. We recommend getting some good quality construction paper, rolls of paper and white card stock. It’s also great to have watercolor paper and scrapbook paper on hand if you can buy them when there are sales. Scissors-Learning to use scissors is an important preschool skill. 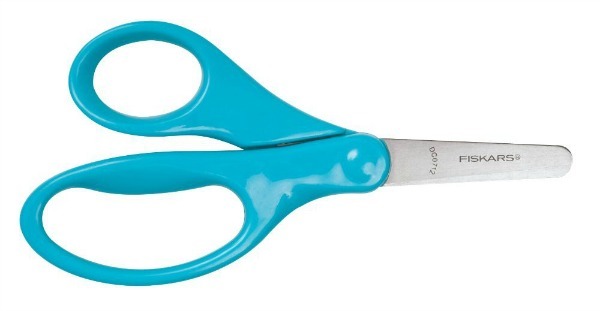 Grab a pair of child-size blunt tip scissors for practice and art projects. Sidewalk Chalk-In addition to using sidewalk chalk for creating art, we use sidewalk chalk for many outdoor learning games and movement activities. Glue–White school glue and glue sticks are must-haves for arts and crafts. Writing Tools-Giving kids the opportunity to experiment with different kinds of writing tools can help motivate them to write and inspire creativity. We recommend that you have crayons, markers, colored pencils and pencils available for home preschool. Washable Paint-A set of washable paints is a must, and kids go through a lot of it. 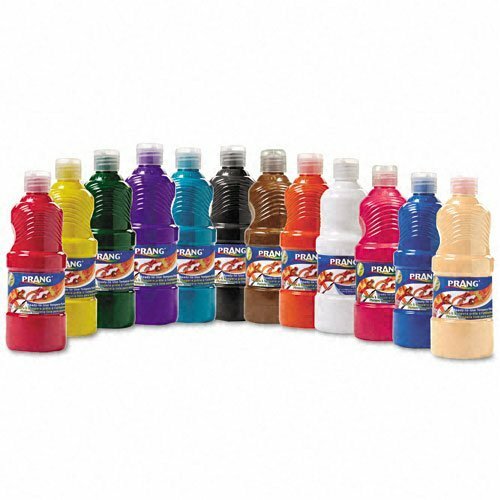 We recommend Crayola Washable Paints or this bulk set of washable paints if you do a lot of painting projects. It’s also nice to have a set of watercolor paints on hand for independent paint activities. Recyclables-Set aside a small space to gather recyclables in your home. They can be used to make DIY learning games, crafts, and other creative projects. Things you might consider collecting are: cardboard boxes, cardboard tubes, egg cartons, disposable lids from containers, paper grocery bags, bubble wrap, fabric scraps from outgrown or stained clothes that can’t be donated, magazines, greeting cards, clear plastic bottles, styrofoam, packing peanuts, etc.). 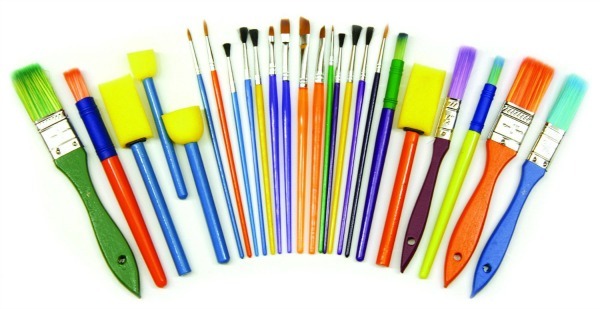 Paint Brushes-You can use many different household items as paint brushes or even make your own. A good set of paint brushes in different sizes and shapes will also get a lot of use. Sharpies-I just heard you gasp! Don’t worry. The sharpies are mostly for you. They’re great for making learning games, labeling things, etc. But you can also hand over the sharpies to the kiddos once in a while for art projects. They love using them! Drop Cloth-Home preschool can be messy, and we think it should be! But let’s help you save some clean up time, too. We recommend that you have some sort of drop cloth. It can be placed under chairs if need for particularly messy projects that you want to be able to shake off into the trash quickly–think glitter, confetti, etc! You can also lay it out under painting projects indoors or outside. We recommend something that is easy to wash off like a shower curtain liner or a vinyl table cloth. Work Mats-We use these as another time save for clean up time. If your work space is not one that you are okay with getting crayon, glue, paint, etc on, then you can have kids put down a work mat. Then kids get to work without worrying about coloring on or scratching the table, and you can easily toss the work mat into the sink for a quick wipe when they are done. We keep a stack of sturdy plastic placemats on hand for this purpose. You can usually find them in various colors and styles in the kids’ dishware section of stores. Manipulatives with Letters and Numbers on Them-Kids will use these often for hands-on learning activities. 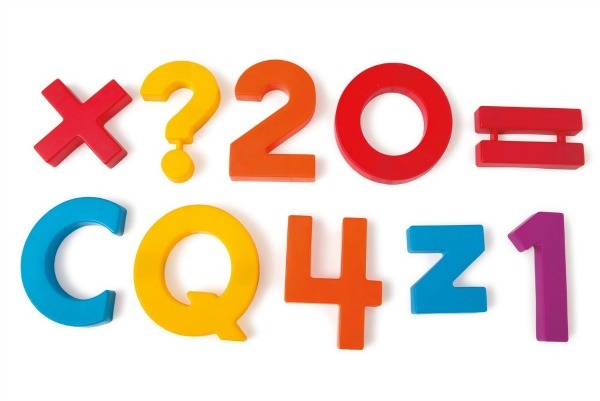 There are many different options including magnetic letters and numbers, letter beads, homemade manipulatives like bottle caps or smooth rocks labeled with letters and numbers, etc. Wooden Blocks-In addition to building and creative play, wooden blocks can be used for a variety of literacy, math and science activities. There are so many excellent options and variations to choose from when it comes to wooden blocks, so we won’t go into all the details. A simple beginning block set like these would be great for starters. Large Plastic Bin-Large clear plastic bins are perfect for water play, sensory bins, and small worlds. We use ours all the time. Play Dough-Whether store bought or homemade, playdough is excellent for strengthening fine motor muscles. It’s also fantastic for creative play and many learning activities. Tape-In addition to a lot of paper we go through a lot of tape for home preschool. A small bit of it is used to prepare materials and hang items, but most of it goes toward creative activities. And learning how to peel and place tape is another great way to strengthen fine motor muscles. You might consider adding transparent tape, Mavalus Removable Tape (for hanging on walls), painter’s tape and decorative washi tape to your collection. General Craft Supplies-Whether you choose to do crafts, process art, or both, craft supplies will come in handy for encouraging creativity, tinkering and more. You may already have many items around your home. For other materials we don’t recommend running out and buying a whole craft closet full of items to begin with. Just add what you need over time. Some things you might like to have are : cotton balls, q-tips, coffee filters, paper plates, pom poms, glitter, chenille stems, googly eyes, tissue paper, glitter glue, foam sheets, feathers, yarn or other string, ribbon, craft sticks, straws, stickers, cupcake liners, rubber bands, felt sheets, etc. 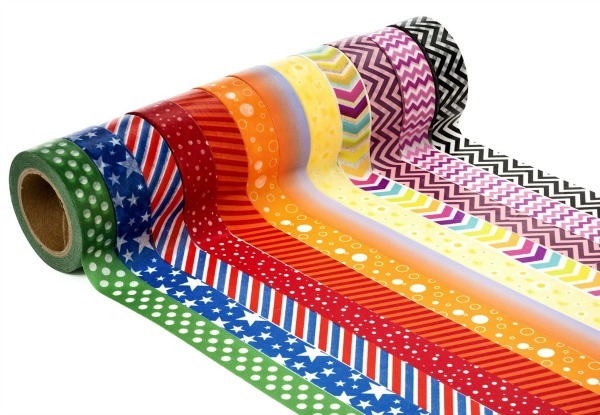 Clear Contact Paper–Contact paper is a versatile supply that can be used to make crafts, set up sticky walls or sensory tables, and more. Dry-Erase Markers and a Dry-Erase Board-You’ll notice preschoolers go through a lot of paper. Having a dry erase board and markers can be a novel way for kids to practice drawing and writing while also saving some paper. You can even make your own dry erase boards out of white panelboard from stores like Home Depot and Lowe’s. You can have them cut to size. Ziploc Bags-These are helpful for organizing and storing materials, but they are also used for activities like sensory bags and mess-free painting. 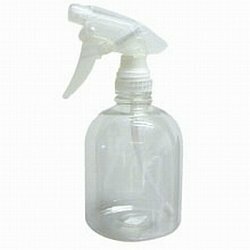 Spray Bottles and Squirt Bottles-These are great for sensory play and art activities. Often you can find them at Dollar Tree. If not, these spray bottles and these squirt bottles would work well. Food Coloring-You’ll use food coloring for science experiments, some sensory activities, and maybe homemade play dough. Common Household Items-In your pantry you may already have things like flour, corn starch, salt, vinegar, baking soda, cream of tartar oats, rice, and beans for sensory play recipes and sensory bins. Shaving Cream-Buy the cheapest generic kind you can find, and have a ball with shaving cream sensory play. There are many variations of learning activities and homemade play recipes you can try with shaving cream. Low-Temp Glue Gun-Some crafts and materials will need a stronger glue, so a low-temp glue gun is helpful in those situations. Later your child can also learn to use the glue gun for building and creative projects. This glue gun can be used with or without the cord, which is very helpful when working around little ones. Clothespins-Use these for hanging materials, learning activities and more. Paint Sample Chips-You can get these free at your home decorating store and use them in a variety of ways. We’ve used them to make DIY learning games, for color matching activities, for art projects, etc. Stapler and Staples-Just an everyday stapler comes in handy for stapling homemade books and some craft projects. 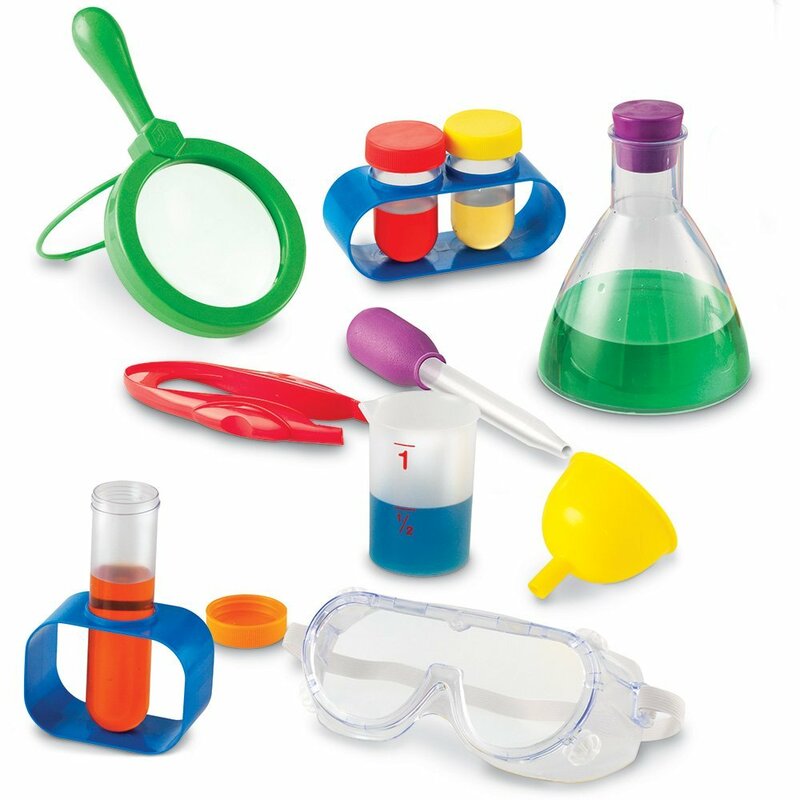 Science Kit-Little scientists like having science tools. Some basic goggles, test tubes, and a hand lens can be a fun addition to your science time. We even heard from a Home Preschool Help member recently that there were some fun options at Dollar Tree. Electric Pencil Sharpener-Can you say sanity saver? An electric pencil sharpener is great for both your regular pencils and your colored pencils–which tend to be in need of sharpening quite a bit! Shaunna has used this electric pencil sharpener in the classroom and at home for over 6 years and it’s still going strong. It adjusts to fit different pencil sizes, even the large beginner pencils. And it even has a light that indicates when the pencil is sharpened…you know, so your little one doesn’t disintegrate the whole pencil the first time it’s sharpened. 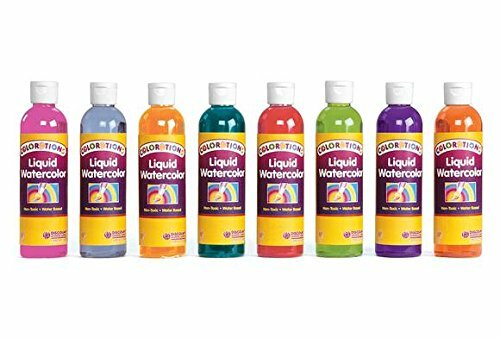 Liquid Watercolors-If you enjoy doing a lot of art activities liquid watercolors are a great investment. They’re washable, so they are a bit better to use for homemade play dough than food coloring. And they can be used for many art projects. Laminator-It can be helpful to use a laminator for items you’ll be using over and over again in order to protect them and make them last longer, especially if you’ll be using some of the same materials again later with a younger sibling. Do-A-Dot Markers-Use these for both art projects and learning activities. You can get bingo dotters at Dollar Tree for this purpose, but if you have it in your budget we recommend the original Do-A-Dot Markers. They don’t splatter or bleed as much as the Dollar Tree version. They are washable, and you can get more colors. Hole Punch-If you are making a portfolio or memory book of some kind a three-hole punch is a must, and it can also be used for calendar or other learning notebooks your child might use. We also suggest having a single-hole punch on hand for some art activities and material preparation. Golf Tees–Golf tees can be used for some learning activities, art projects, and DIY geoboards. Baking Sheet-We sometimes use baking sheets to place learning activities on. They are also helpful for containing the mess for some science and art projects. They can also be used with magnetic pattern blocks and other magnets for various activities and quiet time play. Muffin Tin-These can be used for sorting and counting activities. When doing collage art you can also put materials for kids to choose from in them. Index Cards-We ue these from time to time for art projects or to make DIY learning games. You’ll notice we left certain things off like floor puzzles, learning games, etc. 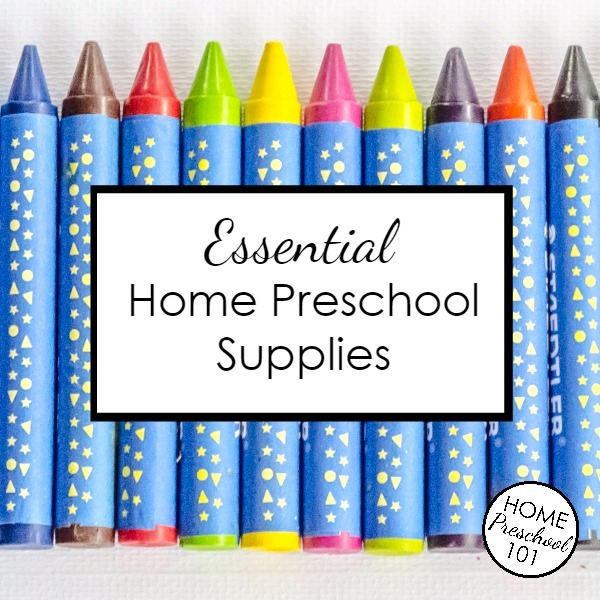 While these things are great supplements to home preschool, we tried to keep this list as short as possible, so we have not explored those areas for now. However, we might share a few ideas for learning toys in the future. They can make great holiday and birthday gifts once you’ve got your basic materials in place. And that was A LOT of information. We hope you find it helpful! Now here’s the printable checklist we promised. Use it to keep track of what you already have on hand and what you’d like to add to your home school supplies in the future. Did we miss any “essentials”? We’d love to know what you use regularly for home preschool in the comments!